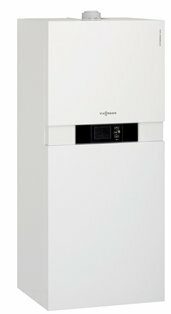 Review of the Viessmann boilers for space and residential water heating. Explore the wall mounted and floor standing models with the condensing technology for great energy savings and reduced gas emission. Viessmann is the German manufacturer of heating equipment, established in 1917. Today, the company has over one dozen factories on three continents, including North America (one factory is in Canada). 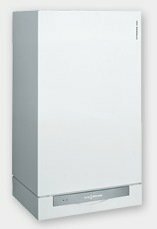 There are three groups of gas-powered boilers made by Viessmann and sold in US and Canada, all using condensing technology for space and domestic water heating. Two types are wall-mounted and one is floor standing, all designed with the zero clearance to combustibles, sealed combustion and with the flexible venting, where pipes can run up to 200 feet, for some models. The boiler’s high energy efficiency of over 90%, in some cases 98%, makes condensing technology one of the most economical and cleanest for water heating, while contributing greatly to environmental protection. The wall-mounted boilers are coming from 100-W and 200-W series,where 100-W models are designed for space heating with an option to add a domestic how water (DHW) kit for heating potable water, while the 200-W models already include the DHW heat exchanger and circulating pump. The floor-standing models from 222-W series are designed mainly for space heating, while the add-on DHW kit installs as a separate element and connects to the main heater. The stand-alone boilers are also condensing units, but are much bigger than boilers from other two groups, plus these boilers utilize the enclosed water storage tank and expansion tank. Viessmann boilers have in common many quality elements and features that help in better fuel economy, cleaner energy and better comfort for the users. With the power range from as low as 3.5 kW to the maximum of 155 kW, and water flow rate from 6.2 GPM to 38 GPM, Viessmann boilers are equally recommended for residential and commercial applications. One of the most important elements of the Viessmann gas boilers is the Inox-Radial heat exchanger that is made of stainless steel for protection against corrosion, durable and reliable work. The company guarantees the element for ten years against leaks. The heat exchanger allows every boiler to operate at very low water temperatures and temperatures of exhaust gases, and provide extremely high energy efficiency. Other exclusive Viessmann’s features are the modulating MatriX cylinder gas burner and powered fan with the variable speed, all working to provide an ultra-efficient heating with the reduced gas emission and extremely quiet operation. There are also many other elements that provide great benefits to its users such as the high altitude operation of up to 10,000 feet, no fuel conversion kit required, multi-unit operation, integrated control unit, outdoor reset function, many safety elements and more. For more details, check the model reviews.